A migraine is a type of headache. It may occur with symptoms such as nausea, vomiting, or sensitivity to light and sound. In many people, a throbbing pain is felt only on one side of the head. A migraine headache is caused by abnormal brain activity. This activity can be triggered by many things. But the exact chain of events remains unclear. Most medical experts believe the attack begins in the brain and involves nerve pathways and chemicals. 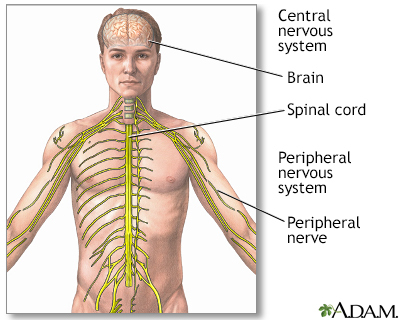 The changes affect blood flow in the brain and surrounding tissues. Migraine headaches tend to first appear between the ages of 10 and 45. Sometimes, they begin earlier or later. Migraines may run in families. Migraines occur more often in women than men. Some women, but not all, have fewer migraines when they are pregnant. True migraine headaches are not a result of a brain tumor or other serious medical problem. Only a health care provider who specializes in headaches can determine if your symptoms are due to a migraine or other condition. Other nervous system symptoms include yawning, difficulty concentrating, nausea, trouble finding the right words, dizziness, weakness, numbness, and tingling. Some of these symptoms are much less common with migraine headaches. If you have any of these symptoms, your provider will likely order tests to find the cause. An aura often occurs 10 to 15 minutes before the headache, but can occur just a few minutes to 24 hours beforehand. A headache does not always follow an aura. Your provider can diagnose migraine headache by asking about your symptoms and family history of migraines. A complete physical exam will be done to determine if your headaches are due to muscle tension, sinus problems, or a brain disorder. There is no specific test to prove that your headache is actually a migraine. In most cases, no special tests are needed. 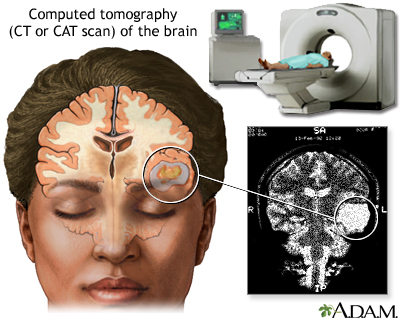 Your provider may order a brain CT or MRI scan if you have never had one before. The test may also be ordered if you have unusual symptoms with your migraine, including weakness, memory problems, or loss of alertness. An EEG may be needed to rule out seizures. A lumbar puncture (spinal tap) might be done. There is no specific cure for migraine headaches. The goal is to treat your migraine symptoms right away, and to prevent symptoms by avoiding or changing your triggers. A key step is learning how to manage your migraines at home. A headache diary can help you identify your headache triggers. Then you and your doctor can plan how to avoid these triggers. Botulinum toxin type A (Botox) injections may also help reduce migraine attacks if they occur more than 15 days a month. Some people find relief with minerals and vitamins. Check with your provider to see if riboflavin or magnesium is right for you. Taking medicines more than 3 days a week may lead to rebound headaches. These are headaches that keep coming back due to overuse of pain medicine. Taking too much acetaminophen can damage your liver. Too much ibuprofen or aspirin can irritate your stomach or kidneys. If these treatments do not help, ask your provider about prescription medicines. These include nasal sprays, suppositories, or injections. The group of medicines most often used is called triptans. Some migraine medicines narrow the blood vessels. If you are at risk for having a heart attack or have heart disease, talk with your provider before using these medicines. Some migraine medicines should not be used by pregnant women. Talk with your provider about which medicine is right for you if you are pregnant or planning to become pregnant. Other medicines treat symptoms of migraine, such as nausea and vomiting. They may be used alone or along with the other drugs that treat the migraine itself. Feverfew is an herb for migraines. It can be effective for some people. Before using feverfew, make sure your provider approves. Herbal remedies sold in drugstores and health food stores are not regulated. Work with a trained herbalist when selecting herbs. Each person responds differently to treatment. Some people have migraines only rarely and need little to no treatment. Others need to take several medicines or even go to the hospital sometimes. You are experiencing "the worst headache of your life." You have speech, vision, or movement problems or loss of balance, especially if you have not had these symptoms with a migraine before. Your headache pattern or pain changes. Treatments that once worked no longer help. You have side effects from your medicine. You are taking birth control pills and have migraine headaches. Your headaches are more severe when lying down. Becker WJ. Acute migraine treatment in adults. Headache. 2015;55(6):778-793. PMID: 25877672 www.ncbi.nlm.nih.gov/pubmed/25877672. Diener H-C, Kurth T. Migraine and stroke. In: Grotta JC, Albers GW, Broderick JP, et al, eds. Stroke: Pathophysiology, Diagnosis, and Management. 6th ed. Philadelphia, PA: Elsevier; 2016:chap 43. Marmura MJ, Silberstein SD, Schwedt TJ. The acute treatment of migraine in adults: the American Headache Society evidence assessment of migraine pharmacotherapies. Headache. 2015;55(1):3-20. PMID: 25600718 www.ncbi.nlm.nih.gov/pubmed/25600718. Silberstein SD. Headache management. In: Benzon HT, Rathmell JP, Wu CL, Turk DC, Argoff CE, Hurley RW, eds. Practical Management of Pain. 5th ed. Philadelphia, PA: Elsevier Mosby; 2014:chap 30. Reviewed By: Luc Jasmin, MD, PhD, FRCS (C), FACS, Department of Surgery at Providence Medical Center, Medford, OR; Department of Surgery at Ashland Community Hospital, Ashland, OR; Department of Maxillofacial Surgery at UCSF, San Francisco, CA. Review provided by VeriMed Healthcare Network. Internal review and update on 01/19/2019 by David Zieve, MD, MHA, Medical Director, Brenda Conaway, Editorial Director, and the A.D.A.M. Editorial team.